Hamilton County Community Unit District No.10 School District geographically is located in southeastern Illinois and encompasses approximately 80% of the total land area of Hamilton County, Illinois covering almost 375 square miles. 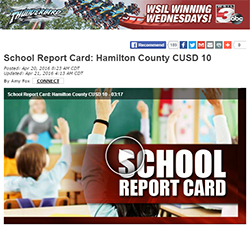 Hamilton County Unit School District consists of Dahlgren Elementary, East Side Elementary, Hamilton County Pre-School, Family Resource Center, and Hamilton County Junior/Senior High School. Check out a few of our success indicators on the District Strategic Dashboard. The student population served by the district is 1,299. The county seat and largest town in the area is McLeansboro with a population of 2,800. McLeansboro is located on Illinois Route 142 and Route 14 approximately 24 miles east of Interstate 57 and 12 miles south of Interstate 64. (map) Hamilton County is primarily a rural community with the local coal mine, Hamilton Memorial Hospital, and the school district as the largest employers. Current unemployment figures show Hamilton County as being lower than that of surrounding counties. Hamilton County Jr./Sr. High Library is a participant in the Amazon Services LLC Associates Program, an affiliate advertising program designed to provide a means for sites to earn advertising fees by advertising and linking to amazon.com.